A consultation has been launched today by Stuart McMillan MSP in a new attempt to support the NHS claw back the millions it spends on treating industrial diseases. The consultation seeks views on a Bill put forward by Mr McMillan, and would allow the recovery of costs associated with NHS treatment for industrial diseases caused by negligence. The legislation would see the NHS repaid for a wide range of industrial diseases including industrial deafness, asthma, skin diseases and asbestos-related conditions. 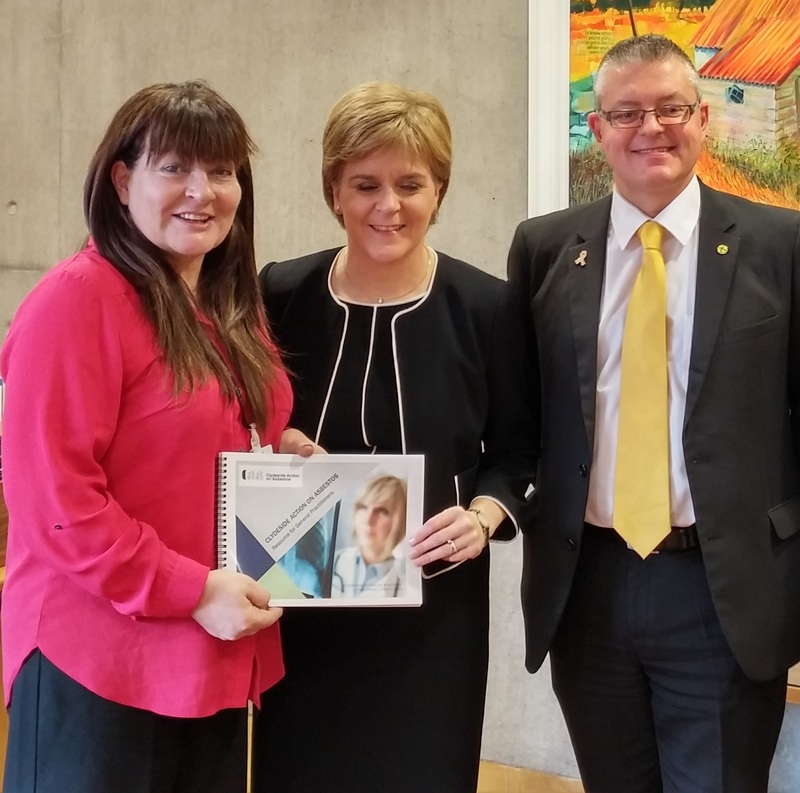 Stuart and Phyllis with the First Minister. He said: “For many years the NHS has been able to recover the costs of injuries caused by road traffic accidents – I would like to see that principle extended to industrial diseases. The NHS in Scotland should not be disadvantaged by paying the financial price for the care and treatment of individuals whose injuries have been caused by a person or organisation’s negligence. “I believe that the NHS in Scotland should also be fairly compensated when it treats someone who suffers from an industrial disease. “In my own constituency of Greenock and Inverclyde there is a dreadful legacy of industrial disease, particularly asbestos-related conditions. This legislation would allow the NHS in Scotland to recover much needed cash, as millions are spent each year on treating industrial diseases which people have contracted through poor working practices and conditions. Recovery of NHS costs of treatment for those injured in accidents caused by the negligence of others has been a recognised concept in Scotland since the Road Traffic (NHS Charges) Act 1999. Phyllis Craig MBE, Manager of Clydeside Action on Asbestos said: “Recovering the costs for treatments for those who have sustained an Industrial Injury is an issue that we have been raising for some time. “The costs to the NHS of treating people who have had industrial injuries or developed industrial injuries should be met by the insurers as part of the civil compensation process. The consultation closes on Friday 22 June 2018.